I'm straying from the normal subjects of this blog today. I found the letter below so very touching, it was amongst some of my mother's papers and is correspondence sent to her sister, Ella English. 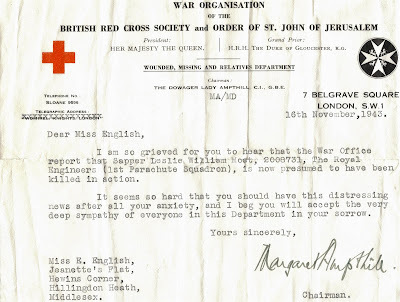 Ella's fiance, Sapper Leslie William Moat 2008731, was killed in World War 2 and this is how she received the news of his death - just imagine. Sometimes with all of the news on our televisions, the Internet and in the media it's easy to forget the reality of wars, the sheer awfulness. It's not some computer game, lives are lost or disabled and sadness and sorrow follows for many families. This letter somehow says it all (click to make image bigger). All I could find out about Sapper Moat was that he died on 24 November 1942, aged 25 years old. He was with the 1st Parachute Squadron, Royal Engineers and took part in the North African campaign, during Op Torch. He is now commemorated on the Memorial at Medjez-el-Bab War Cemetery, Tunisia. As for Aunt Ella, she never married. How different her life would/could/should have been. Damn. This is sad. & incredibly impersonal.